If you’re driving around your neighborhood and spot a large area of sleek, bluish panels on the roof of a house, it’s probably an array of solar electric panels, sometimes called PV or photovoltaic modules. These panels are being used to produce electricity to run home appliances and lighting (but not heating appliances). At the molecular level of heat transfer, solar electric collectors convert solar radiation directly into electricity. Solar radiation strikes a solar cell, usually made of a semi-conductor such as silicon, and causes it to release electrons. Because the voltage of a single solar cell is low, a large number of cells are connected together in series to form a module. The modules are wired together to form an array. The array may be mounted on the roof or on a rack built on the ground. The electricity generated by a solar electric system may be used immediately, stored in batteries, or returned to the utility grid. In the latter case, homeowners receive credit for what is produced, thereby lowering their electric bill. In effect, the utility company serves as “storage” for electricity that’s produced during periods of the day when you don’t need it. It’s also there as a backup for cloudy periods when you aren’t producing much electricity. Contact us today for a free consultation and estimate for installing a renewable energy system. Begin generating your own electricity! We service Ithaca, Rochester, Syracuse, Auburn, Webster, Pittsford, Cortland, Canandaigua, Fairport, and the surrounding New York area. Chrystalline solar modules can be made from monocrystalline or polycrystalline cells. Together they comprise the vast majority of solar modules on the market today. Monocrystalline cells are made by slicing manmade silicon crystal ingots, or loaves, into wafers. The wafers look like thin pieces of glass. Polycrystalline cells are made in a similar fashion, except that the ingot is formed from masses of smaller crystals, not a single crystal. Polycrystalline wafers resemble frost crystals on a window. Thin film collectors are made by depositing various semi-conductor materials in very thin layers on various substrates, including glass and flexible backings. Amorphous crystalline silicon is the most widely used, despite having a lower efficiency than other semi-conductors. When the semi-conductor material is protected by glass and is not flexible, the thin-film solar collectors are referred to as modules. When the semi-conductor material is protected by a flexible cover, thin film solar collectors are called laminates, not modules. Thin film modules and laminates are significantly less efficient than crystalline modules, but their $/watt (DC) cost is lower, too. They are lightweight, too. In fact, laminates weigh up to 10 times less than crystalline modules. Nevertheless, thin-film modules and laminates account for a small fraction of total solar module sales, partly due to the fact that they require 2.5 to 4 times more roof space to produce the same kW-hr/yr output. The residential application that has drawn the greatest interest for thin film PV are standing seam metal roofs and as ‘solar shingles.’ Many people like the concept, even though they get less electricity from them than they would from an array of modular solar electric collectors of the same area. 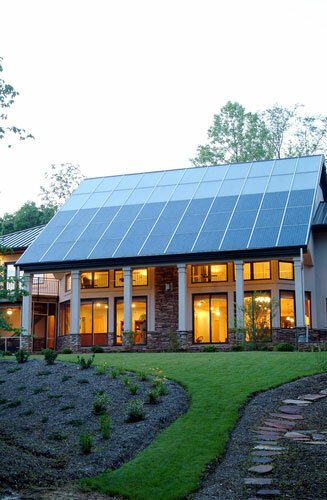 Various Federal and state incentives may be available to homeowners wishing to install a solar system. You can find out what’s available in your area by going to the Database of State Incentives for Renewables & Efficiency at www.dsireusa.org. In general, domestic hot water and swimming pool applications have the shortest paybacks and require the smallest investments. Solar electricity installations designed to satisfy a significant portion of your electrical needs may require much larger investments. Leasing programs, if available in your area, dramatically reduce the cost of installing a system. With regard to space heating, passive solar house design is generally a more economical approach than active solar heating systems that require massive storage tanks or bins. Passive solar houses collect heat during the day and usually store it in masonry walls and floors from which it is released at night, when the temperature drops. Regardless of what type of solar system you’re contemplating, begin conserving energy now. It costs a lot less to replace light bulbs with energy efficient ones and to insulate the attic and walls than it does to install a solar electric or solar heating system! Contact Halco today for a home energy assesment to find out the best way for you to reduce your energy consumption and cost without sacrificing comfort. We offer our services in Ithaca, Rochester, Syracuse, Webster, Fairport, Auburn, Cortland, Canandaigua, Pittsford, Geneva, Penfield, Hilton, Spencerport, Brockport, and more!